Reggae Caribbean Cookout paying homage to VP Records contribution to 90s Dancehall era and also introducing Gimme A Buss (Jamaican meaning Give me a break) a spotlight for Reggae singers and bands. Reggae Caribbean Cookout is pleased to announce that VP Records the pioneer record label in the music industry will be sponsoring this year’s events. VP Records was started by husband and wife team Vincent and Patricia Chin in 1979. Today VP Records is the world’s largest Reggae company. There compilation series ‘Strictly the best’ allowed UK and world wide Reggae lovers to listen to the latest Reggae and Dancehall hits coming out of Jamaica. Reggae Caribbean Cookout patrons can expect the usual format that has made the event such a success. Listening to vintage Reggae, Ska and Rock-steady but this year with a added 90’s Dancehall segment. You will be able to bogal, nanny and butterfly to big tunes from artists such as Chaka Demus & pliers, Shabba Ranks, Lady Saw, Buju Banton and more. 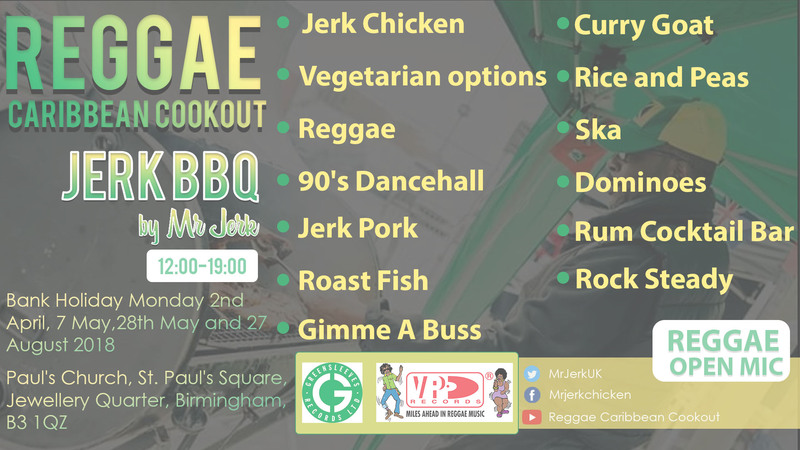 Birmingham Street Food trader Mr Jerk brings a taste of Jamaica with his authentic Jamaican jerk BBQ and traditional dishes such as Jerk Chicken, Jerk Pork, slow cooked curry goat, rice and peas, sweet golden fried dumplings and plantains, roast fish and his special vegan and vegetarian options all to be enjoyed outside with a chilled out vibe giving that Jamaican holiday feel. For more information check Facebook page mrjerkchicken and Twitter MrJerkUK.